Statue of John McNeese on the campus. 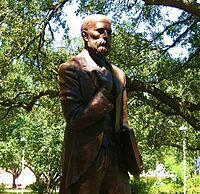 McNeese, a regional pioneer educator, is the namesake of the university. McNeese State University was founded in 1939 as a division of Louisiana State University and was originally called Lake Charles Junior College. It offered only the first two years of higher education. McNeese opened its doors on an 86-acre (350,000 m2) tract donated by the Calcasieu Parish Police Jury, the parish governing board. There were two original buildings: the former Administration Building (Kaufman Hall) and the McNeese Arena (Ralph O. Ward Memorial Gym). The auditorium, now Francis G. Bulber Auditorium, was completed in 1940 as the third building on the campus. These three buildings are still in use today. 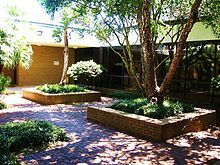 The name became John McNeese Junior College in 1940 by resolution of the University Board of Supervisors in honor of Imperial Calcasieu Parish's first superintendent of schools. In 1950, the college became an autonomous four-year institution as McNeese State College. The bill was advanced by State Senator Gilbert Franklin Hennigan of DeRidder in neighboring Beauregard Parish. It was separated from Louisiana State University and renamed McNeese State College. Its administration was transferred to the Louisiana State Board of Education. In 1960, legislators authorized McNeese to offer curricula leading to the master's degree; in 1966, the degree of Educational Specialist was first offered. In 1970, its name changed to McNeese State University. McNeese was first accredited in 1954 by the Southern Association of Colleges and Schools. Dr. Lether Edward Frazar (1944–1955) Retired in 1955, became lieutenant governor of Louisiana thereafter. Dr. Wayne N. Cusic (1955–1969) Retired in 1969. Dr. Thomas S. Leary (1969–1980) Resigned from presidency. Dr. Jack Doland (1980–1987) Resigned in order to run for state office. 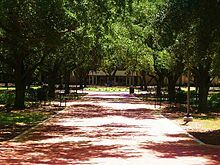 The main campus occupies 121 acres (0.49 km2) lined with oak trees in the heart of south Lake Charles. The main campus includes 68 main buildings. In addition, the physical plant also includes the 503-acre (2.04 km2) McNeese Farm, a 65-acre (260,000 m2) Athletic plant, Burton Coliseum, the Louisiana Environmental Research Center, and nearly 1,600 acres (6.5 km2) of donated farm property used for research, farming, and ranching. A renovation of the quadrangle was recently completed to relieve the flooding that plagued students during rainy days. The Southwest Louisiana Entrepreneurial and Economic Development (SEED) Center has also been recently completed, allowing local business leaders and McNeese students to work in tandem. The newly renovated Jack V. Doland Field House, which now houses offices for all of the football coaches, equipment manager, conditioning and strength coach and members of the athletic administration as well as the ticket office, held its official grand opening and ribbon cutting ceremony September 9, 2011. A commemorative statue of John McNeese has recently been placed near Smith Hall, and new decorative signs have been built on each corner of the main campus. Also, a recent $16 million annex to the Shearman Fine Arts Center has been completed and renovations have begun on the older sections of the facility. The McNeese State Recreational Sports Complex includes two weight rooms, basketball courts, tennis courts, an indoor track, and an Olympic-size swimming pool. Contraband Bayou runs through the southern portion of the McNeese campus. The Shearman Fine Arts Center stands behind the McNeese Entrance Plaza. McNeese is the first university in the State of Louisiana to offer a concentration in forensic chemistry. It is one of the first schools in the nation to offer a concentration in terrorism, preparedness and security. The College of Nursing and the Department of Mass Communications are housed in the Juliet Hardtner Hall, named for a McNeese donor and daughter of the Louisiana timber magnate and conservationist, Henry E. Hardtner of La Salle Parish. The Department of English and Foreign Languages, in conjunction with the local chapter of Sigma Tau Delta, publishes The Arena, which is an annual collection of art, essays, fiction, and poetry by students, regardless of major. Fifteen members of faculty have received Fulbright Awards. Faculty members in the Departments of Engineering, Performing Arts, Social Sciences and English and Foreign Languages have taught in Rwanda, Romania, Greece, Korea, and Wales, among other countries. In the Department of English and Foreign Languages alone, four faculty members have received Fulbrights. McNeese is the only institution in the state of Louisiana to have a Kodály Certification Program as part of its Music Education degree. The College of Business is accredited by the Association to Advance Collegiate Schools of Business. Less than 5% of the world's business schools are accredited by this prestigious association. McNeese recently formed an Institute for Industry-Education Collaboration that will offer training courses as well as continuing education courses for local Lake Area industries and graduates of McNeese. Frasch Hall is home to the Department of Biology and Health Sciences. Gayle Hall houses the Harold and Pearl Dripps Department of Agricultural Sciences. Cowboy Stadium, also known as "The Hole"
McNeese's colors are blue and gold. The men's sports teams are known as the Cowboys, while the women's athletic teams are the Cowgirls. McNeese State sports teams participate in NCAA Division I (Football Championship Subdivision (I-AA) for football) in the Southland Conference. The football team plays at Louis Bonnette Field at Cowboy Stadium, which seats 17,000 fans. It is also known as "The Hole" and is located near campus. The team played in the inaugural Independence Bowl game in 1976, a 20–16 victory over Tulsa. They went on to make two more appearances in 1979 and 1980. The Cowboys football team have more recently played in two Division I-AA Finals, in 1997 and 2002. The Cowboys basketball and volleyball teams both moved into the new H&HP arena in 2018. This gave the basketball teams their first on-campus facility since leaving the Ralph O. Ward arena. In 1956 the Cowboys won the NAIA Division I Men's Tournament. It was the only appearance the Cowboys made in the NAIA tournament. McNeese State defeated Texas Southern 60 to 55. The men's basketball team has made two appearances in the NCAA Men's Basketball Tournament, most recently in 2002, and the team has qualified for the NIT three times, the most recent invitation being in 2011. The women's basketball team earned their first invitation to the "Big Dance" in 2011, by sweeping the Southland Conference Tournament. In 2011, both the men's and women's basketball teams claimed the Southland Conference title in their respective divisions, marking the first time in the 25-year history of the Southland Conference that the men's and women's teams from the same university have won regular-season titles in the same year. The baseball team plays games at Cowboy Diamond. The Cowboys' baseball teams have made several appearances in the NCAA Division I Baseball Championship, most recently in 2000 and 2003. The McNeese Cowgirls soccer team plays their games at Cowgirl Field. The soccer program began in 1996, and has since claimed 1 regular season Southland Conference Championship in 2007 and 1 Southland Conference Tournament Championships in 13 tournament appearances. In 2015, the Cowgirl Soccer Team named Drew Fitzgerald just the second Head Coach in program history, following Scooter Savoie who had been at the helm since the founding of the program in 1996. Fitzgerald, who had previously served as the team's Associate Head Coach, made an immediate impact in the program, leading the Cowgirls to a 9-10-1 record and taking the sixth place seed in their 13th Southland Conference Tournament appearance and their first appearance in the second round of the tournament since the 2008 season. The last and only time the Cowgirl Soccer team was able to capture the Southland Conference Tournament title and earn a bid to the NCAA Championship tournament was in 2006, when the team suffered a 2-0 first round loss to Southern Methodist University. McNeese State University's speech and debate team is recognized as a national powerhouse and boasts numerous national championships over the last 40 years. The McNeese State University newspaper is The Contraband, a weekly publication which has existed since 1939. The university's award-winning student yearbook is The Log. It was first published in 1941. The Greek community of McNeese State University comprises 14 Greek letter organizations. Kerry Joseph – quarterback of the Edmonton Eskimos of the CFL. Luke Lawton – NFL fullback/half back for Indianapolis Colts, Philadelphia Eagles, and now with the Oakland Raiders. Tom Sestak – defensive tackle for the Buffalo Bills; in January 1970, Sestak was selected as a member of the All-Time All-AFL Team, and in 2009 as a member of the Bills' 50th Anniversary Team. ^ "McNeese State University". McNeese State University. McNeese State University. Retrieved 29 July 2015. ^ a b c "Preliminary Headcount Enrollment Summary". Louisiana Board of Regents. September 2016. Retrieved 2016-10-19. ^ "The Official Home of McNeese Athletics" (PDF). mcneesesports.com. ^ "MSU Encyclopedia, K through R". ereserves.mcneese.edu. ^ McNeese State University. "McNeese State University". Archived from the original on 2013-08-03. Retrieved 2018-09-02. ^ "College ROI Report". www.payscale.com. Payscale. Retrieved 26 September 2018. ^ "McNeese State Wins Sixth Southland Conference Title with 92-74". ^ a b "Cowgirl Soccer Quick Facts" (PDF). McNeese State University Athletics. McNeese State University. Retrieved 13 November 2016. ^ Bonnette, Matthew. "McNeese makes changes in soccer program". McNeese State Athletics. McNeese State University. Retrieved 14 November 2016. ^ Bower, Hunter. "Soccer Season Comes to End In Semifinal Round Loss". McNeese State Athletics. McNeese State University. Retrieved 14 November 2016. ^ "Greek Life". www.mcneese.edu. McNeese State University. Archived from the original on 2 April 2015. Retrieved 2 April 2015. ^ "Dr. Chuck Quarles' Introduction of Dr. Joe Aguillard, Inauguration Ceremony, March 23, 2006" (PDF). lacollege.edu. Archived from the original (PDF) on March 22, 2013. Retrieved July 28, 2013. ^ "Zack Bronson". daabaseFotball.com. Archived from the original on October 23, 2012. Retrieved November 26, 2012. ^ "Ben Broussard Stats". Baseball Almanac. Retrieved November 26, 2012. ^ "Tierre Brown". Basketball-Reference.Com. Retrieved November 26, 2012. ^ "Michael Ray Charles Art21 PBS". pbs.org. Retrieved February 6, 2014. ^ "Mike Danahay". 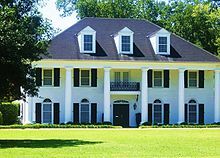 house.louisiana.gov. Archived from the original on May 2, 2015. Retrieved April 20, 2015. ^ "Dr. Grady A. Dugas". The News-Star. March 26, 2007. Archived from the original on February 18, 2015. Retrieved February 18, 2015. ^ "Joe Dumars". Basketball-Reference.Com. Retrieved November 26, 2012. ^ "House District 36". enlou.com. Archived from the original on April 6, 2016. Retrieved December 10, 2009. ^ "Ray Fontenot Stats". Basketball Almanac. Retrieved November 26, 2012. ^ "Dorothy Hill's Biography". Project Vote Smart. Retrieved April 22, 2015. ^ "Bob Howry Stats". Basketball Almanac. Retrieved November 26, 2012. ^ "Luke Lawton". databaseFootball.com. Archived from the original on March 4, 2016. Retrieved November 26, 2012. ^ "MALLET, DEMOND - Welcome to EUROLEAGUE BASKETBALL". www.euroleague.net. ^ "Keith Ortego". databaseFootball.com. Archived from the original on January 7, 2016. Retrieved November 26, 2012. ^ "Kavika Pittman". databaseFootball.com. Archived from the original on November 2, 2012. Retrieved November 26, 2012. ^ "John Thomson Stats". Baseball Almanac. Retrieved November 26, 2012. ^ "Newsmaker of the Year". theind.com. Retrieved June 23, 2013. 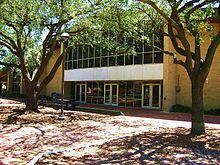 Wikimedia Commons has media related to McNeese State University.